Lasagna is one of the world’s favorite comfort foods. This bacon and egg lasagna is a twist from a classic lasagna recipe. Our bacon and egg lasagna recipe still has everything that you love about lasagna — gooey cheese, tasty noodles, and savory sauce. But, we added other ingredients that you like too: bacon and eggs. This delicious and unique meal will be a hit with your family. Even after a long, stressful day, no one will leave the dinner table in a bad mood. They’ll all feel content and full. 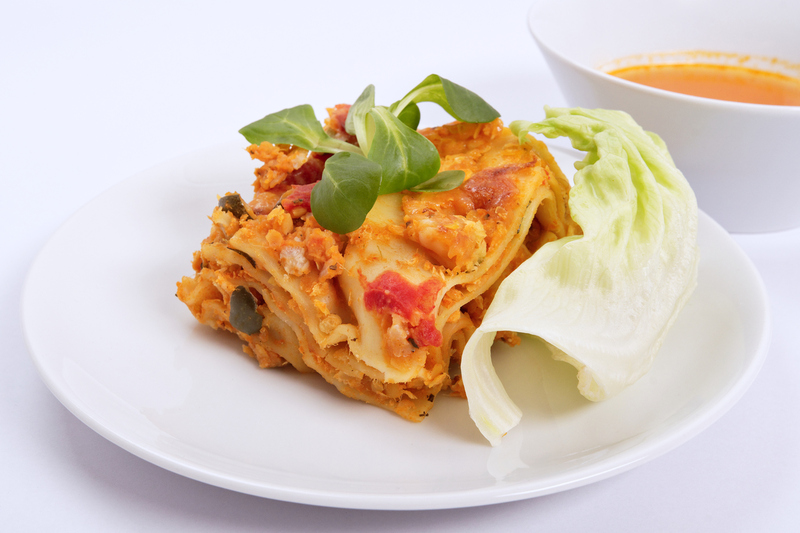 This lasagna is a great recipe to use when you have guests. With up to about 12 servings, you can wow many friends and family members with this unique dish. They’ll definitely ask you for the recipe before they head home! If you’re ready to make a homemade bacon and egg lasagna, follow along with our recipe below! Cook the lasagna noodles according to the instructions on the packaging. Drain them and set aside. In a skillet, cook the bacon over medium-high heat until it is crispy. Once you finish cooking the bacon, move it to a paper towel-lined plate. Drain most of the fat from the skillet but leave a bit leftover. Add the onion and saute it until it is soft. Then, add the flour, salt, black pepper, parsley flakes, and basil. Stir the mixture until it is well combined. Gradually pour in the milk, stirring constantly. Bring the mixture to a boil and cook it for two minutes, still stirring constantly. Remove it from the heat. Grease a 9x13x2″ baking dish. Spread 1/2 cup of the sauce in the bottom. Cover the sauce with four noodles. Cover the noodles with 1/3 of the bacon, egg, shredded cheese, and sauce. Repeat two more times for the other layers. Cover the top with the grated Parmesan cheese. Bake the lasagna for 35 to 40 minutes, or until it is bubbling around the edges. Let it sit for 15 minutes, then serve. Note: You can also assemble the lasagna before baking it. Follow steps two through six, then refrigerate. When you’re ready to cook it, take it out and let it sit for 30 minutes, then bake it for the regular amount of time. When you use Sauder Eggs, you know you’re using ingredients of the highest quality. Use them for this bacon, egg, and parmesan lasagna recipe to make it even better. We partner with farmers who become an extension of our business. They agree we should only produce the highest quality eggs. Use our store locator to find the closest retailer to you today.